Sony has just revealed that there will be a limited edition version for their upcoming remastered collection of Kingdom Hearts games called Kingdom Hearts HD 2.5 ReMIX. 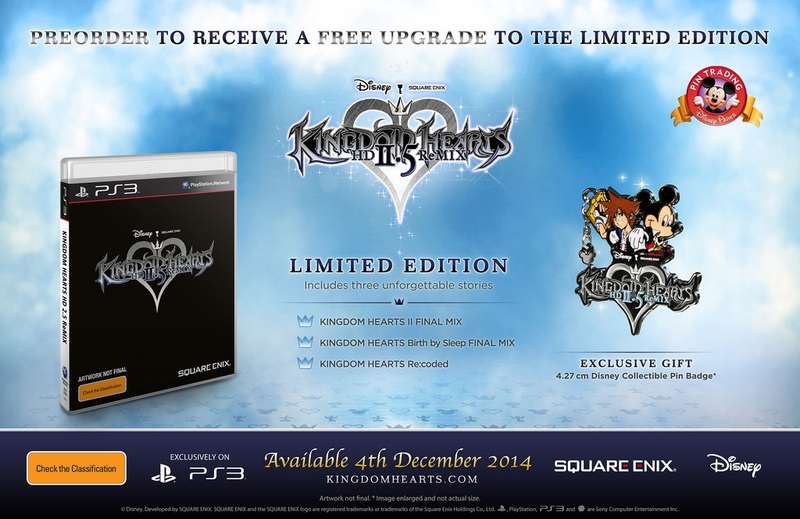 The limited edition will be available for anyone who pre-orders the game, meaning that you get upgraded to the limited edition for no extra charge. So what comes with the limited edition of the game? Well… a pin. Yup. If you pre-order the game, you get a 4.27 cm pin of Sora and Mickey that will apparently be in extremely limited quantity. Check out the image below. In all honesty, the pre-order incentive with this one is pretty lame. With Kingdom Hearts HD 1.5 ReMIX you got the game in a really nice sleeved, hardcover booklet that had a bunch of great concept art for the game. With this it looks like you only get a keychain. Not only is that a downgrade, but it’s gonna look especially pathetic when you put the two games next to each other on a shelf. Kingdom Hearts II is my favorite of the two original games, and now it’s gonna look like a chump compared to the first one! This entry was posted in All, Featured, News, PlayStation 3 and tagged Kingdom Hearts HD 2.5 Remix on July 24, 2014 by Mike Guarino.